We continue our discussion of shared frailty models with a focus on interpretation of the results using various calculations based on the parameter estimates. The estimated variance of frailty at the family level is 0.2142. In terms of Clayton's model this means that the hazard given that a sibling died at age a is 21.4% higher than the hazard given that the sibling survived age to a. A more direct approach is to look at the actual distribution of frailty. 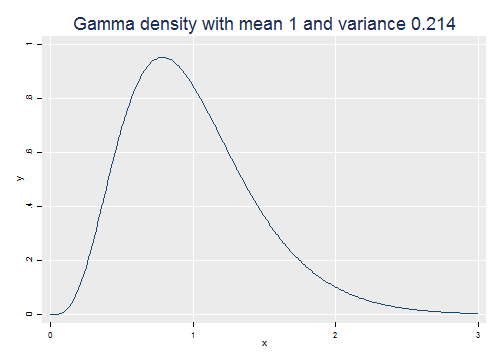 Stata has a function gammaden(a, b, g, x) to compute the density of the gamma distribution with shape a, scale b (which is 1/ß in our notation) and location g (here 0). b = 1/a. R has a function dgamma(x, shape, rate = 1, scale = 1/rate) to compute the density of the gamma distribution with given shape and scale (or its reciprocal the rate). Recall that the estimated variance is the reciprocal of the shape parameter. We can also compute quantiles. Stata has a function invgammap(a, p) to compute quantiles of the standard gamma distribution with shape a, which has scale 1 and location 0. A gamma with shape a and scale b is just b times a standard gamma with shape a. 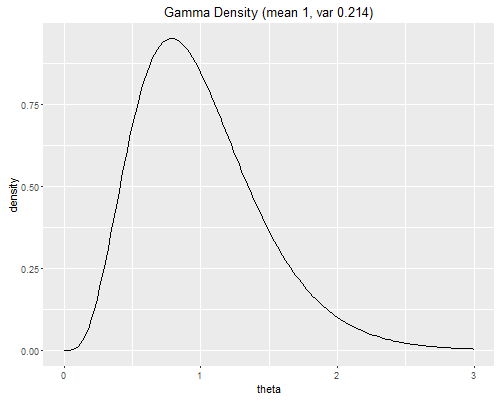 In R we use qgamma(q, shape, rate = 1, scale = 1/rate, lower.tail = TRUE) to compute quantiles. So here are the quartiles of the distribution depicted above. So the quartiles are 0.66, 0.93 and 1.26. Computing the ratios Q1/Q2 and Q3/Q2 we see that families with frailty at Q1 have 29% lower risk, and families with frailty at Q3 have 36% higher risk, than families with median frailty. Clearly, unobserved family characteristics have a very substantial effect on child survival. It may be interesting to contrast the above results with the risks that can be attributed to observed characteristics. At this point we need the results from the piecewise exponential model with gamma frailty. I saved the file generated in the previous log as PebleyStupp2.dta. We read the file and fit the model again. and then read the parameter estimates from PebleyStupp2.dat. Next we simply predict the hazard holding family frailty constant at one. Remember, however, that each child contributes one or more pseudo observations, but should be counted once only, so we pick first segments. Next I will focus on a mother who is 26 years old, pretty close to the mean age, is having a second child (so we can include the length of the first interval as a predictor), and has not experienced a child death before giving birth to the second child. We consider first the case where the preceding birth interval is 3 years or longer. The relevant parameters for age, age-squared, birth order and previous birth interval are in positions 6, 7, 8, and 13 of the vector of parameters. So the probabilities of infant and child death for the average 26-year old mother having a second child are 5.7 and 8.6% with a three-year interval and 14.1% and 20.7% with a one-year interval. So for a low-risk (Q1) family the probability of child death goes from 5.8 to 14.2 when we compare long and short intervals. For a high-risk (Q3) family the corresponding probability goes from 10.8 to 25.4%. One last calculation we can do explicitly under gamma heterogeneity involves the marginal and joint probabilities of infant and child death for two children in the same family. So the probability of two children surviving to age five is slightly higher than the product of the two marginals. A better way to see the correlation is to calculate a two by two table with survival to age five for two children in the same family. The last calculation is an odds ratio: the odds of one child dying by age five are 23.9% higher if the other child died by age five than if the other didn't! A separate note discusses the use of log-normal frailty, which has the important advantage that it extends easily to multi-level models. Calculation of unconditional survival, however, requires numerical integration. The results are very similar to those presented here.